It is with great sadness that we announce the sudden passing of Shaun Tyler Donald on June 15, 2014. Born in Liverpool September 9, 1990, he was the eldest son of Angela Greek Dagley (Corey), Bridgewater. 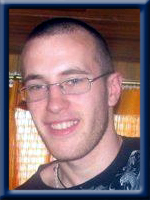 Shaun was a very strong-willed, polite, caring and compassionate young man. He was a hard worker and would help anyone in need without even having to be asked. His family and close friends meant the world to him. Shaun enjoyed so many things in his short life; camping at the lake and participating in the woodsman competitions. Kettle Boil was his favourite dry activity. Shaun loved canoeing, tub racing and best of all the Log Roll. Shaun loved working with his father in the yard on any project there was. From the time Shaun was 4 he had a tool of some kind in his hand. Shaun loved working on vehicles, carpentry and fishing. At the age of 12, Shaun was a member of the Navy League in Bridgewater. He was such a proud cadet. He was an amazing fundraiser for them and any school fundraising event they held he was first to sign up for. Shaun raised so much money for Hebbville school that he won a stereo and a painting they had as prizes. He was so very proud of his accomplishments. Shaun enjoyed playing soccer, street hockey and ice hockey on the lake with the kids from the neighborhood. Shaun enjoyed the company of many people who made a big impact in his life to which he gained some true morals. Surviving besides his parents are his sister Alexandra Greek (Matthew Snook), nephew Xander of Lunenburg, brother Lucas Greek of Bridgewater, grandmother Anna Greek (Carla Roy) of Liverpool, grandparents Willard(Donna) Dagley of West Dublin. Numerous uncles, aunts, cousins and people that he felt were extended family. He was predeceased by his grandfather Donald Greek and his aunt Marianne Greek Blackwell. Great-grandparents Harold and Ena Greek, William “Bill” and Kathleen “Kay” Tarr. To Anna and the rest of Shaun’s family we express our sincere sympathies on the loss of your loved one! So sad to lose one so young…God bless you all! Although we did not know this young man, we are really saddened to hear of such a tragedy, sympathy to all of his family and friends. So Sorry to hear about Shaun’s sudden passing! Our deepest sympathy to all the family! With heavy hearts we send our deepest condolences to all the family. So sorry for the loss of your loved one. Hold your memories close to your heart. I cant even imagine what you and your family are going through. Hold your memories close to your heart, it will help in the days to come. We will keep you in our thoughts and prayers. so so sorry for your loss. we send our deepest sympathy to the family. our thoughts and prayers are with you. R.I.P.SHAWN . We are so very sorry for your loss, Shaun was a great individual who always had a smile on his face and will be dearly missed by everyone who knew him… Prayers are with you all at this hard time. Jess, Jeremy, Isaiah and Aleia. we are so sorry to hear of your loss. Shaun had such a short life. he will be greatly missed. our thoughts and prayers are with you all. So sorry to hear about Shaun’s sudden passing. Our hearts go to the Greek/dagely family I could not imagine. Angela, Anna and family; I am so sorry for your loss. I know the family but did not know this young man but reading the comments looks like he was well loved by all who did know him and taken away at to young of an age. Please accept my sincere condolences. Angela and Family: We were sorry to hear about the loss of your loved one. Our thoughts and our prayers are with your family. I cannot imagine what you are going through. I remember when Shaun was born. My heart cries for you. Please know that you are in my thoughts and prayers at this very difficult time. Hold your memories close to your heart. Gabe also sends his deepest condolences. Anna, Angela and all the family: We are so sorry to hear of your loss, our thoughts and prayers are with you all. May you all find comfort in each other at this sad time. Our deepest condolences. so very sorry to hear of Shaun’s passing he will be missed by so many family and friends .hold your memories close to your heart it will help in the days to come . you are in our thoughts and prayers ..
We are very sorry for your loss. Our thoughts and prayers are with you and your family. So shocked and saddened to hear about Shaun, he seemed like a nice young man. I remember him from the Woodsman Competitions. Our heartfelt sympathies. My sympathy and condolences to all of you. It is never easy to lose a loved one but even more difficult when that loved one is young. You are in my thoughts and prayers. Anna & Family – We are sorry for your loss. Our deepest condolences are with you all at this difficult time…. So sorry to hear what happened, thinking of you and your family. We are sending love from Alberta. So sorry to hear about Shaun he was a good guy we always loved to see him at the lake and my kids will miss him lots…. As so will we . Thoughts and prayers go to Angela and Corey and the rest of his family and friends. He will truly be missed but he will always be in our hearts and memories …… Hugs to all at this sad time……. My heartfelt and deepest sympathy to all the family. I will cherish my memories of Shaun very dearly and he will always have a special place in my heart. Prayers being sent your way. My thoughts and prayers are with you now and the time ahead. So sorry to hear of your grandson’s passing. Very sad. Love and prayers. To Angela and family, I am sorry to hear about Shaun-Tyler. It has been a while since I had seen him but I remember the twinkle in his eye and the mischievous grin when talking to him. He liked to talk, that one. I cannot be at the funeral because of my drug infusion but I will be thinking of you that day. We were shocked and very saddened to hear of your loss. Our thoughts will be with you hoping that caring friends will help make your burden lighter. Our affections and condolences go out to you. To Angie and family, so sorry for your lose. Shaun was an amazing loving young man. He will be surly missed. My family and especially myself are here for you. Hugs and kisses. Angela, Anna & Families === We were saddened to hear of Shaun,s tragic passing . Even though we didn,t know him personally , he was a cousin & will be greatly missed by all .Sounds like he was a very well liked young man who loved & was loved by all who knew him .RIP SHAUN . Cousin Lloyd & Barb. Were sorry for your loss. We are thinking of you at this sad time. We are so sorry to hear about your son dear . We are thinking about you & our throughts goes out to you & family . Sending sincere condolences for your very sad loss. What a shock to read of Shaun’s passing, at such a young age. My thoughts & prayers are with you all at this sad time. May GOD bless you all. Take care of each other & remember the good times.